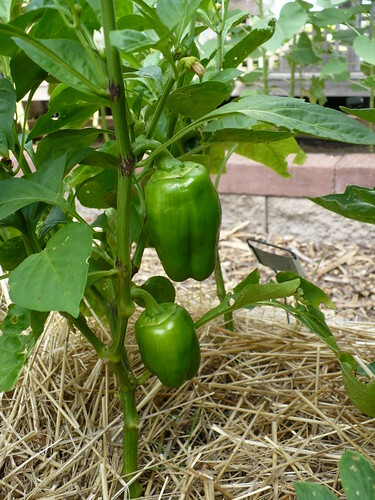 Peppers are always a lot of fun to grow because there are so many different types. In our Family of 4 Garden this year, we have bell peppers, Italian roasting peppers, banana peppers, jalapenos, sweet snack peppers, and chili peppers. 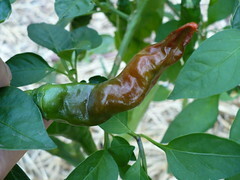 In the Asian Garden, we have 3 different peppers: Shishito, Sapporo Hot, and Yatsufusa. 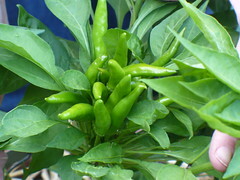 Now, I think most of us are familiar enough with most peppers that we can pretty much figure out what to do with the peppers in the Family of 4 Garden. The peppers in the Asian Garden are a completely different story! The trick with these Asian peppers is that they don’t really look or behave like most of the peppers that we are used to. They have much thinner walls, more seeds, and it’s just hard to know when they should be picked and how they should be used. Yesterday we went back to the catalog to try and determine what to do with all these different peppers. So obviously they are starting to turn red on us, which means that theoretically they are past the typical harvest stage. The fruits are about the right size, and they are very wrinkled, almost like there isn’t anything inside them to fill them out. To me, they taste a little bit “green”. As in not-yet-ready green. Definitely not hot though. Maybe the key is to cook them? We’ll have to give that a try. This variety is a heavy producer so far, which is nice. Or it will be once we figure out how to cook them. So from the description, it’s definitely a safe bet to let these peppers go red and dry. Some of the older ones are starting to turn red. However, they don’t seem to stay “juicy” when they turn, they actually start drying on the plant as they turn red. Like the Shishito peppers, these seem to have very thin walls, but packed full of seeds. 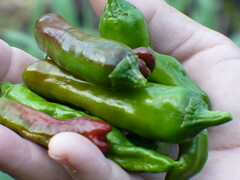 As green peppers, they have a rather floral flavor, but a level of heat that is rather comparable to a very hot serrano pepper. My mouth is still tingling from the one bite I took! I think our Yatsufusa peppers are definitely getting close to turning red. And I don’t love y’all enough to taste one of these guys, even green. Sorry. Maybe I’ll give it a try next time I’m planning to make an Asian dish. Actually, I think we’ll have enough hot peppers that I could make stir-fry every day for the rest of the summer! At this point, I’m predicting that the Family of 4 Garden this year is going to out-produce the garden from last year, at least dollar-wise. I could be wrong, but there’s a lot of the season left, and we’ve barely started the summer vegetable season! We harvested about 1/2 to 2/3 of the ‘Yellow Sun’ carrots. They weren’t all as big as they could have been, but I’m not sure they are going to grow much more for the time being. We left the smallest ones in the garden to see if they will grow some more with most of their competition gone! We also pulled out the row of ‘Chioggia’ beets. They had lost most of their tops due to disease and competition from the taller carrots shading them out. 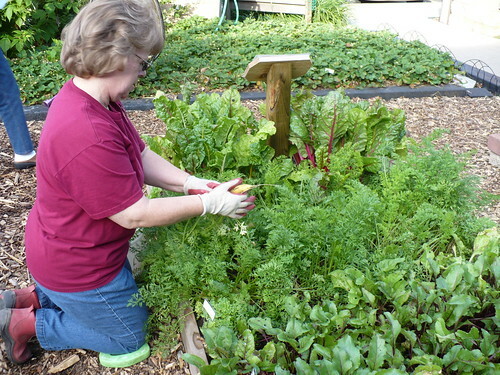 We also pulled some of the larger ‘Red Ace’ beets. There were a few more tomatoes and peppers also adding to our coffers. The “baby” long beans certainly don’t look very baby when you think about the size of a regular green bean! 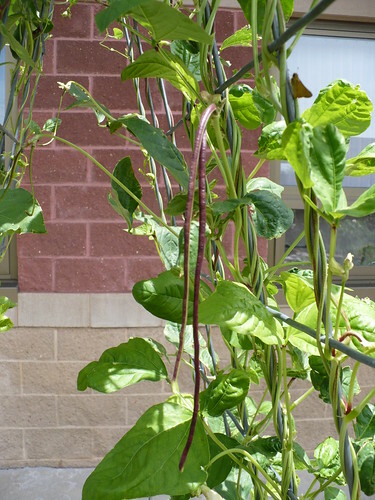 These are two Chinese Red Noodle Long Beans, and they are going to be that beautiful, dusky red-purple color, even as they get bigger. They will turn green with cooking, but they are fun to look at until that point. These beans are already about 6 to 8″ long, and they will probably be at least double that size when we harvest them. I’ll have to add that to my list of things to do – finding a good recipe or two for using Chinese Long Beans! Speaking of recipes, I did actually post the handout from last Friday’s Lunch in the Garden on Beets & Carrots. There’s a recipe featuring carrots, a recipe featuring beets, and the main recipe featured both carrots and beets! It was really tasty, so you definitely missed out on a tasty treat last Friday. I have two sets of pictures that I could use for today’s photoessay. I have the “happy” pictures of pretty flowers and vegetables, and then I have the depressing pictures of sick and dying plants. Since I’m guessing that most of you would rather see the “happy” pictures, and I couldn’t figure out how to turn this blog post into a “choose your own adventure” type post, I’ll go that route. However, if you really want to see the plants in throes of pain and suffering, I’ll give you a link after every happy picture to balance it out. This first picture is a bit of a mixed bag in and of itself. This is our 100 gal. 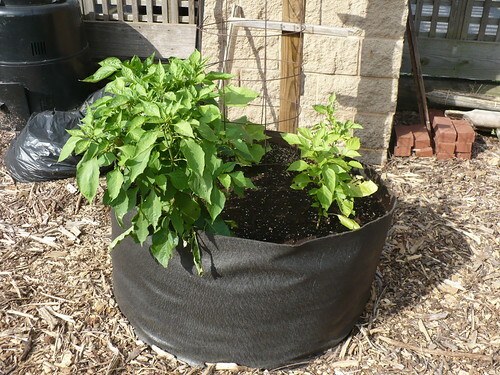 Smart Pot that has 4 pepper plants and a cucumber plant in it. The two pepper plants on the left are gorgeous and flowering. The two pepper plants on the right are pale yellow (looks like they need some nitrogen! ), and chewed upon. The cucumber isn’t bad, it’s just being really really pokey about growing. I suspect that it thinks it isn’t getting enough sun in that spot. 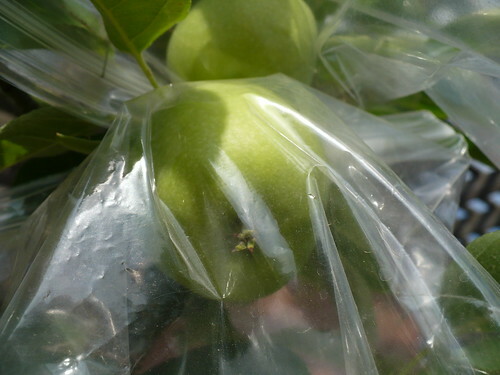 Our three bagged apples on the columnar apple tree are growing and doing well inside their little baggies..so far. Even though this kind of looks like a smothered apple, if you want to see another sad plant picture, you can click to get an eyeful of some Black Rot on our grapes. The Brandywine Tomato is finally starting to flower. It’s been taking its own sweet time about it. This flower is huge, and it looks like it’s actually a double. See the two centers? 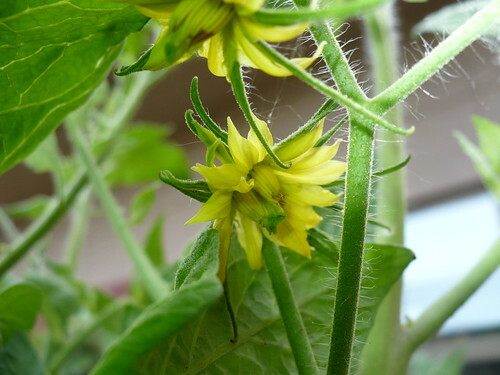 If this flower sets a tomato, it’s going to be huge and strange! 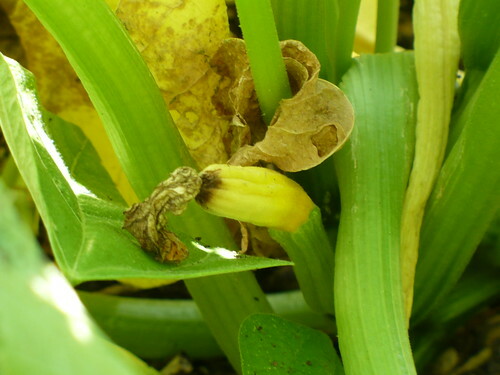 If you want to be morbid about it, you can take another look at the Early Blight that’s getting started at the bottom of this same plant. This ‘Early Sunsation’ Bell pepper has a few baby bell peppers set. They should get a lot bigger before harvest. Technically they will also turn yellow if you leave them on the plant long enough. I think the plan this year is to harvest them when they are mature size but still green, since that means that the plant will actually produce more peppers instead of pouring all it’s energy into 2 or 3 yellowing peppers. Completely unrelated to peppers, but if you want to see another diseased plant, you can look at the gorgeous, highly decorative spots that are showing up on our strawberry leaves. 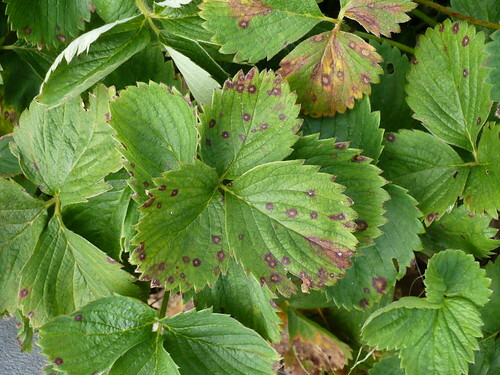 If you find you want to know everything there is to know about Strawberry Leaf Spot, you can check out this website from Cornell. Since ours is not a commercial plot, we probably aren’t going to do much about it at this point. 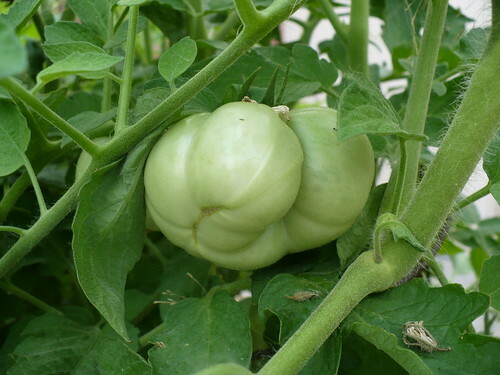 This is one of the immature tomatoes on the ‘Brandymaster’ tomato plant, the hybrid version of the Brandywine. It is definitely earlier in setting on fruit than it’s heirloom parent, but the fruit at least promises to be as strange. Both plants are getting absolutely huge! Our beets are also looking a bit puny, although they are a bit better after getting a little fertilizer. Of course, all is not perfectly well. 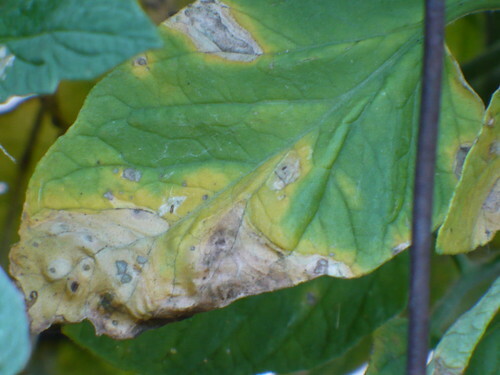 Some of them have more of those beautiful spots…in this case they are Cercospora Leaf Spot. 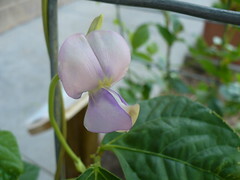 The Chinese Long Beans are starting to bloom, which means we’ll have cute, tiny “long” beans next week. In the meantime we have these gorgeous flowers to enjoy! Sorry, no more sick plant photos. It’s too depressing! Have a great weekend! I was informed that I need to post about what we harvested in the garden this week, even though that harvest is pretty pitiful. 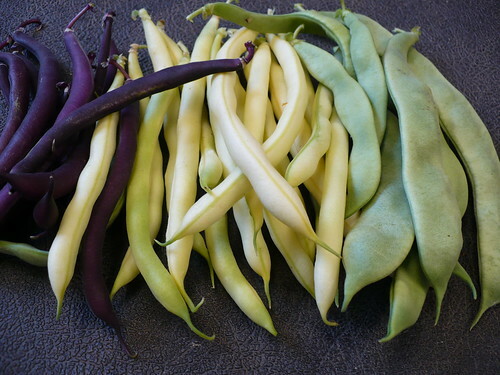 First off, we harvested about 1 1/2 gallon bags of beans – a beautiful mix of purple, yellow, and Italian green beans. And that was it. Seriously. I didn’t even manage to take a picture of our bountiful bean harvest, despite walking past it 5 times with the camera. Surely that rates me as a complete and total failure as a blogger. Wait! I can fix it! There, just for all of you, I walked out to the garden, picked a handful of beans, and laboriously photographed them just so you can get a little taste of what our beans looked like. Now I have to do something with them…like toss them unceremoniously into our curry tonight. I will tolerate almost any amount of vegetable prep in the kitchen, but I HATE prepping fresh beans. One thing we didn’t harvest was gold zucchini? Why? Because for some strange reason, the initial zucchinis have not been adequately pollinated, so they keep dying after a couple days. Like so. Isn’t it sad looking? Of course, I could have solved the problem by eating it while the flower was still on it, but it’s always nice to at least give your vegetables a chance to produce first. Happily, I think there’s a couple that have been successfully pollinated now. Aren’t they gorgeous? You have to come now, right? 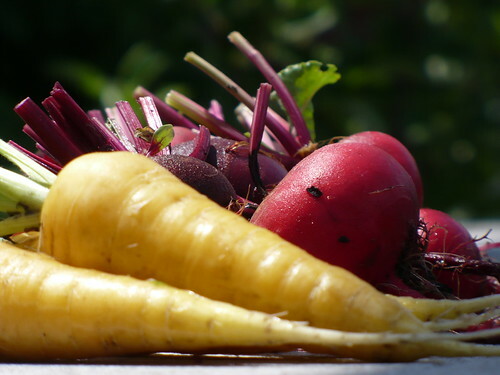 Yellow carrots and chioggia beets are coming your way! In case you’re counting, I estimate that it’s about $4 worth of veggies, bringing our running total to $94.